Well, I’ve made Peanut Butter Balls and Cake Balls (I will put that up on the website soon), but when I read about Oreo Truffles from Better Homes and Gardens, I thought, now this I have to try! You can coat the truffles in any type of chocolate–in the magazine, they used white chocolate–but I decided to use a combination of semi-sweet and milk chocolate. I had a bunch of sprinkles left over, so I decided to use them up, and right after I dipped the truffles in chocolate, I covered them in sprinkles. This recipe uses plain Oreos, but as I went to bed last night, I thought about other combinations you could use: mint Oreos with green colored white chocolate, peanut butter Oreos with dark chocolate, vanilla Oreos with either white chocolate, milk, or semi-sweet chocolate. No wonder I went to sleep so fast! 1. Place Oreos in the food processor or blender and blend until fine. Transfer to a large bowl and add the cream cheese. Mix the cream cheese, by hand, in the crushed Oreos until fully incorporated. Roll into balls and place on cookie sheet covered with wax paper. Place in the fridge until hard, 1-2 hours. 2. Melt candy melts and dip the truffle balls into the melts. Place the truffles back on the cookie sheet. Put truffles back in the fridge until ready to serve. Makes about 40 balls and keeps for 3 days. 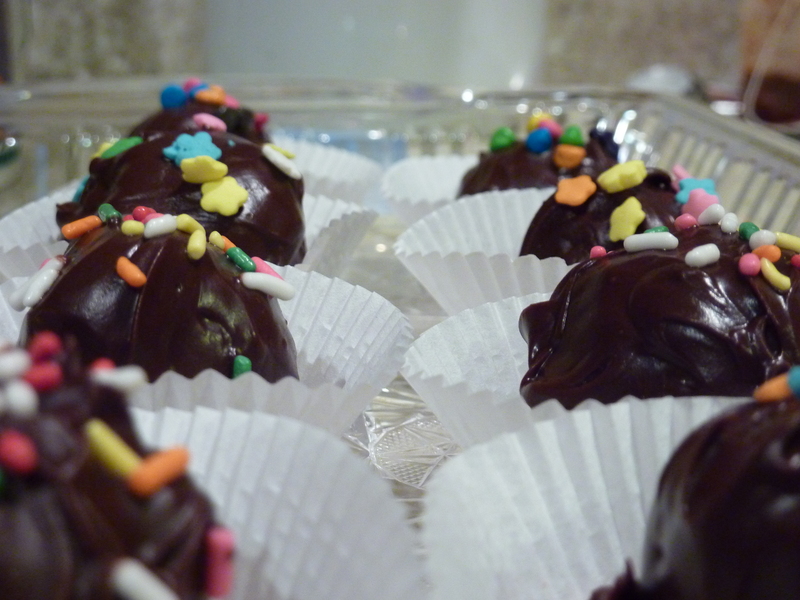 Before you place the coated truffles in the fridge, you can decorate the balls in a variety of ways–drizzle white chocolate or dark chocolate on truffles, coat with sprinkles, have a few decorative sprinkles on the top, etc.